In the past, marketing was based on amazing creative ideas, delivered via mass media channels to a captured audience. The Don Drapers of the world would come up with amazing creative concepts on how to position products and services. These ideas were then pushed through mass media channels, such as TV and newspapers, to us – the consumers. We had no choice. TV shows were interrupted by commercials showing the benefits of smoking. Newspapers were filled with ads trying to convince us that if we buy that car we will also become attractive enough to win over the beautiful woman that is lying on it in a seductive pose. So basically, after they came up with a cool idea, admen could relax and have a drink. 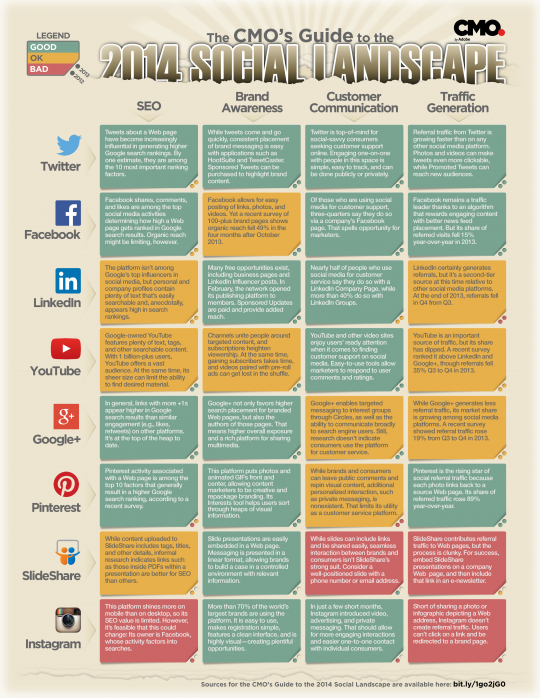 Here’s a great infographic by Adobe that shows the value each social media platform could provide when it comes to traffic generation, SEO, customer communication and brand awareness. When it comes to B2B, LinkedIn is way more important, but still there’s a lot of valuable information here. First, let’s get in the mood for this post.